About PIJUSHI Welcome to PIJUSHI Amazon Official Store. PIJUSHI Co.,ltd is a fashion original designer brands in USA, and always committed to designing and creating unique fashionable high quality handbags that continually redefine timeless style. 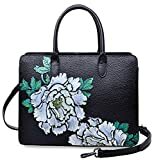 Please Pay Attention: PIJUSHI Co.,ltd is the only official PIJUSHI brand seller on amazon,we never authorize to any other sellers,so for your satisfied,please notify that you buy the bag from our official store.We sincerely hope you can get a real brand bags,a worthy bag and a satisfied bag on amazon. Style handbags designed by designer Jones which goes effortlessly from work to party. Imported leather with embossed crocodile, and zipper opening up to a large storage, Accented with a convenient leather belt strap. A large zip close middle pocket for separation and storage, two open pockets on one side and 1 zipper pockets on the other side for storage. Magnet & Top Zip Closure. Basic Information: Size: L 13" x H 12.75" x W 6.75", handle height: 5", 47" Shoulder Strap Drop Net Weight:1.13kg Remarks: This product is made of top quality Genuine Leather and may has a bit new leather aroma. If you are not used to it, you could just open the package and put it in a ventilate place for a few hours, then the smell will fade away. Package include: 1 x handbag Return Policy: If you receive broken,damaged,wrong item or do not like it,please contact us with some pictures about the stuff you received,and our customer service will figure out the problem and offer you the best solution within 24 hours. If for other reasons, we encourage our customer contact us, we will response in one business day and do our best to service you. About PIJUSHI : Welcome to PIJUSHI Amazon Official Store. PIJUSHI Co.,ltd is a fashion original designer brands in USA, and always committed to designing and creating unique fashionable high quality handbags that continually redefine timeless style. Please Pay Attention: PIJUSHI Co.,ltd is the only official PIJUSHI brand seller on amazon,we never authorize to any other sellers,so for your satisfied,please notify that you buy the bag from our official store.We sincerely hope you can get a real brand bags,a worthy bag and a satisfied bag on amazon. Production Detail: Item Type: 100% PIJUSHI Brand New Top Handle Handbag Outer Material: Full grain Cow Leather Inner Material: Fabric Closure: Zipper Pattern: Floral Size: Approx.L17.5 at top and L 11 at bottom x H9.5x W 6.5 inch (Size may be 2 cm/1 Inch in accuracy due to hand measure ) Occasion: Versatile Please note: The bag color may vary slightly from the online image due to monitor color settings. Package inlcude: 1 leather Handbag Return Policy: Any handbag/backpack/wallet from PIJSUHI shop can be return and replace within 1 months of receipt of shipment in most cases. We strive to provide great customer service and want to make sure you are completely satisfied. If there are any issues, please contact us. Our customer support team is ready to help! About PIJUSHI : Welcome to PIJUSHI Amazon Official Store. PIJUSHI Co.,ltd is a fashion original designer brands in USA, and always committed to designing and creating unique fashionable high quality handbags that continually redefine timeless style. Please Pay Attention: PIJUSHI Co.,ltd is the only official PIJUSHI brand seller on amazon,we never authorize to any other sellers,so for your satisfied,please notify that you buy the bag from our official store.We sincerely hope you can get a real brand bags,a worthy bag and a satisfied bag on amazon. Production Detail: Item Type: 100% PIJUSHI Brand New Top Handle Handbag Outer Material: High Quality Cow Leather Inner Material: Fabric Closure: Zipper Size: Approx.L12.5 x H9.8 x W6 inches (Size may be 2 cm/1 Inch in accuracy due to hand measure ) Occasion: Versatile Please note: The bag color may vary slightly from the online image due to monitor color settings. Package inlcude: 1 leather Handbag Return Policy: Any handbag/backpack/wallet from PIJSUHI shop can be return and replace within 1 months of receipt of shipment in most cases. We strive to provide great customer service and want to make sure you are completely satisfied. If there are any issues, please contact us. Our customer support team is ready to help! About PIJUSHI Welcome to PIJUSHI Amazon Official Store. PIJUSHI Co.,ltd is a fashion original designer brands in USA, and always committed to designing and creating unique fashionable high quality handbags that continually redefine timeless style. Please Pay Attention: PIJUSHI Co.,ltd is the only official PIJUSHI brand seller on amazon,we never authorize to any other sellers,so for your satisfied,please notify that you buy the bag from our official store.We sincerely hope you can get a real brand bags,a worthy bag and a satisfied bag on amazon. Style handbags designed by Williams to those who love nature and their life. The appearance of this purse is a Flower, which goes effortlessly from weekend to party. A back zipper pocket, Zipper opening up to a large storage. A large zip close middle pocket for separation and storage, two open pockets on one side and a zipper pocket on the other side for storage. Basic Information: Outer Material: Leather Inner Material: Fabric Closure: Zipper Size: L 12.5"x H 12"x W4. 5",6.5" Handle high Net Weight:1.10kg Remarks: This product is made of top quality Genuine Leather and may has a bit new leather aroma. If you are not used to it, you could just open the package and put it in a ventilate place for a few hours, then the smell will fade away. Package include: 1 x handbag Return Policy: If you receive broken,damaged,wrong item or do not like it,please contact us with some pictures about the stuff you received,and our customer service will figure out the problem and offer you the best solution within 24 hours. If for other reasons, we encourage our customer contact us, we will response in one business day and do our best to service you. About PIJUSHI Welcome to PIJUSHI Amazon Official Store. PIJUSHI Co.,ltd is a fashion original designer brands in USA, and always committed to designing and creating unique fashionable high quality handbags that continually redefine timeless style. 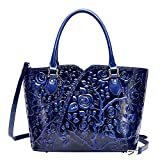 Please Pay Attention: PIJUSHI Co.,ltd is the only official PIJUSHI brand seller on amazon,we never authorize to any other sellers,so for your satisfied,please notify that you buy the bag from our official store.We sincerely hope you can get a real brand bags,a worthy bag and a satisfied bag on amazon. Style handbags designed by Jones which goes effortlessly from work to party. 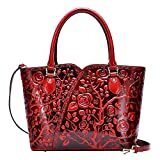 Imported leather with embossed flower, . Accented with high quality Lining and convenient long leather strap, two open pockets on one side and a zipper pocket on the other side for storage. Basic Information: Outer Material: Leather Inner Material: Fabric Closure: Zipper Size: L15"xH10.5"xW6" with handle high 4" Net Weight:1.30kg Remarks: This product is made of top quality Genuine Leather and may has a bit new leather aroma. If you are not used to it, you could just open the package and put it in a ventilate place for a few hours, then the smell will fade away. Package include: 1 x handbag Return Policy: If you receive broken,damaged,wrong item or do not like it,please contact us with some pictures about the stuff you received,and our customer service will figure out the problem and offer you the best solution within 24 hours. If for other reasons, we encourage our customer contact us, we will response in one business day and do our best to service you. About PIJUSHI : Welcome to PIJUSHI Amazon Official Store. PIJUSHI Co.,ltd is a fashion original designer brands in USA, and always committed to designing and creating unique fashionable high quality handbags that continually redefine timeless style. 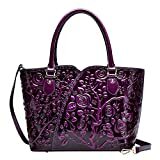 Please Pay Attention: PIJUSHI Co.,ltd is the only official PIJUSHI brand seller on amazon,we never authorize to any other sellers,so for your satisfied,please notify that you buy the bag from our official store.Thanks.. Production Detail: style number: PIJUSHI 22328 Outer Material: Top grain genuine Leather with Embossed and Embossed Floral Pattern Inner Material: Fabric Closure: Zipper Size: L 15.5 x W 5 x H 16.5 inches (Please allow a bitty deviation due to manual measurement) Please prevail in pictures we posted, but please also understand that the color may changed a little due to the different screen from different brand or different settings. Package inlcude: 1 leather handbag. Return Policy: Any questions or problems please feel free to contact us first, we are always at your service to make things easier for you. And our return policies was based on amazon system: within 1 month after your purchase and Quality Re-confirmation for the return items. About PIJUSHI Welcome to PIJUSHI Amazon Official Store. PIJUSHI Co.,ltd is a fashion original designer brands in USA, and always committed to designing and creating unique fashionable high quality handbags that continually redefine timeless style. 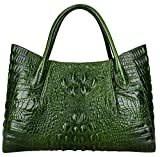 The crocodile collection is once again complete with the PIJUSHI satchel.Beautiful, gorgeous PIJUSHI handbags wrapped in high quality crocodile embossed leather. 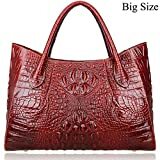 3 Sizes Available: Big Size (Lash Bag) : Size :L 15" x H 11" x W 6.5", with 34" removable length shoulder strap,handle height 5",Weight : 1.3 KG; Structure: Feature buckle opening up to a large storage,A inside zipper bag in the handbags, two open pockets on one side and one zipper pocket on another side for storage. Medium Size(Zipper Bag) : Size: L14.5"x H10"x W5.8", with 45" adjustable&removable shoulder straps,handle height 5",Weight : 1.15 KG; Structure : Zipper open to a large storage, a middle zipper pockets for separate,1 zipper pockets in one side, and 2 open pockets in another side. Small Size(Zipper Bag): Size : L13" x H 9" x W 5.5", with 45" adjustable&removable shoulder strap,handle height 4.5"; Net weight: 1.12kg Structure: Zipper open to a large storage, a middle zipper pockets for separate,1 zipper pockets in one side, and 2 open pockets in another side. Remarks: 1.For Big Size bag, it is lash bag; And for medium size and small size, all are zipper bags and structure are the same, Just size different. 2.This product is made of top quality Genuine Leather and may has a bit new leather aroma. you could just open and put it in a ventilate place for a few hours, the smell will fade away. Package include: 1 x handbag 3.Return Policy: If for other reasons, we encourage our customer contact us, we will response in one business day and do our best to service you.